Ships from and sold by Stealth Rabbit. Sold by MinChen Tech and ships from Amazon Fulfillment. Sold by Jeremywell International, Inc. and ships from Amazon Fulfillment. Innovation and Integrity. To Us, Nothing Matters More. These convictions come first. Innovation means building products that will continue to lead and define the industry in terms of creativity and utility; it means constantly asking ourselves how we can be better. 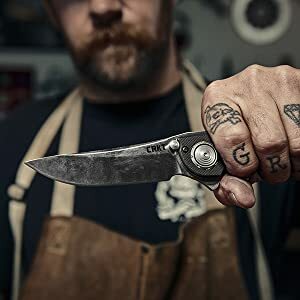 For the past 25 years, we’ve released industry-shifting innovations and worked with some of the most renowned custom and independent knife designers in the world. What really ties it all together though, is our true guiding light. We are guided by integrity—this is critical to how we’ve chosen to do business. It means interacting with our customers and each other honestly and directly. It also means building products that perform reliably and a brand that behaves consistently, decade after defining decade. We were born in Oregon, and our knives and tools truly reflect the rugged terrain from which they come. That, to us, makes all the difference. 6.3 oz. 3.8 oz. 2.6 oz 1 lb. 15.9 oz. We’re proud to work closely with a deep lineup of world-class designers and we take great pride in carrying out their creative, industry-shifting ideas. Launce Barber and Tom Stokes designed the patented* Guppie as part of our innovative I.D. Works line of tools. 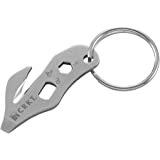 While some think it's cute, it really is a hard-working carabiner tool with dozens of everyday uses. 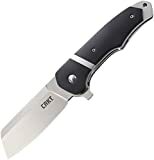 The high-carbon stainless steel blade with a Razor-Sharp edge can be opened and closed with one hand using the blade slot. 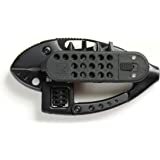 The removable bit carrier is also a high-intensity LED light. It has two strong magnets to hold it securely to the Guppie's left side. 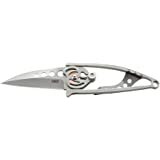 The stainless steel clip will hold the Guppie in your pocket or on gear, which gives a lot of versatility. 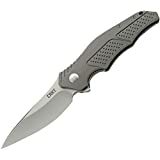 The Guppie makes a great little money clip, too, for those who like to keep a thin wallet. 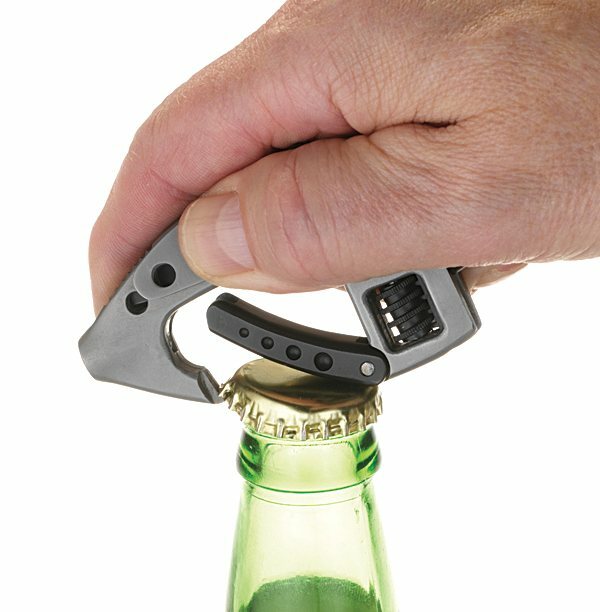 One more trick: The Guppie carabiner detent will open bottle caps and metal jar lids. Part of the innovative I.D. 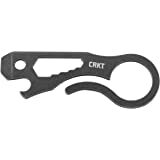 Works line of tools from Columbia River Knife & Tool (CRKT), Launce Barber and Tom Stokes designed the Guppie as a hard-working carabiner tool with dozens of everyday uses. 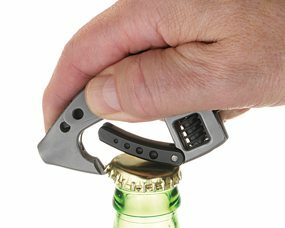 Can even be used as a bottle opener (view larger). 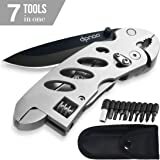 The high-carbon stainless steel blade with a razor-sharp edge can be opened and closed with one hand using the blade slot. A removable bit carrier is also a high-intensity LED light, and it has two strong magnets to hold it securely to the Guppie's left side. 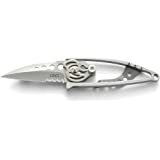 The stainless steel clip will hold the Guppie in your pocket or on gear, which gives a lot of versatility. 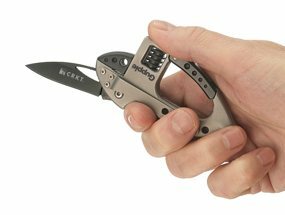 The Guppie makes a great little money clip, too, for those who like to keep a thin wallet. Launce Barber is dedicated to discovering great design ideas by using the most fundamental tool we all share in common–our creative minds. His focus is to produce innovative and creative design by discovering elegant new solutions for old problems. Launce and his long time engineering and design partner, Tom Stokes, have won numerous awards for product design including the prestigious international iF Product Design Award Silver 2004. Includes screwdriver bits (view larger). 3.0 out of 5 starsIt is what it is. For the price, I shouldn't really expect much. For the brand, I sort of expected more. 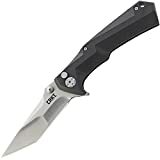 I primarily bought this to put into an EDC case as a small, convenient cover-all type tool. Because of travels, I had planned on removal of the knife blade, a simple T8 fastener is all that holds it in place. The remainder of the tool is sub-par, but will passably do the job if needed. I am surprised at the shoddy workmanship, design and execution of a relatively-popular tool. I am planning on keeping the tool as it "works" and essentially does what it's supposed to. I wish I had seen one in person in a store before purchasing. I'm not one of those people who picks apart products based on made up characteristics, or unrealistic expectations, but just a realist giving honest feedback. 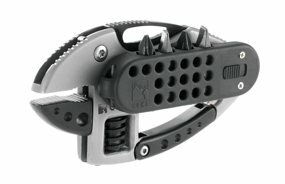 1) Belt clip/carabiner - a tremendous amount of slop in the jaw at the pivot point. So much that it actually won't self-latch at times. Not a big deal in my case, but still shoddy design and workmanship. 2) The adjustment for the wrench head/jaw has a lot of play between the gears of the bottom jaw and the adjuster screw. It's just a subpar design with poorly manufactured/sourced components. This is a real disappointment for me, as this is half the tool functionality for me. 3) Several of the screws were stripped in the assembly process. The main screw holding the wrench adjustment mechanism was clearly overtightened and stripped, damaging the case. As were the tiny Torx belt clip screws. 4) The LED light is very poor. Whatever the lumen output, it's a nominal difference above just letting one's eyes adjust to the environment. A single match puts out more light. 5) The tool caddy for the four included bits has no mechanism by which to hold the bits in place (other than friction). The result is inevitable bit loss. 1) The knife is sharp and stays that way. 2) The tool caddy is magnetic. 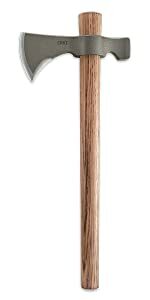 3) The tool itself is overall small, but the body is substantial enough to give weight and strength. The bottom line: for me, it's a $25 poorly designed small adjustable wrench and hex bit driver. If you are considering one of these, I'd highly recommend trying to see one in person before committing to buying. 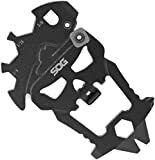 There are probably other tools out there which can accomplish the same things, or a collection of small implements may do the same thing in a better executed fashion. The Guppie is a bit of a mixed bag, but it has high points as well as low points. I've owned two of these and pretty much mix-and-matched when I needed one. In both cases, the plastic section is inferior to the rest of the tool. The mini flashlight never works consistently (it's just the switch, not the actual light, but it's annoying nonetheless) and requires a lot of fiddling. 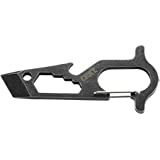 The magnets built into the plastic section are not really strong or large enough to make me feel confident enough to clip this tool somewhere using the carabineer - I put it in a jacket pocket or backpack/bag instead. 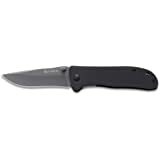 Now the good: the blade is small and very sharp, and the straight edge is easy to keep sharp. The tool tapers toward the socket opening, making it easier to get the included bits into tighter spots (you could also mix and match small bits and even extenders from something like a Leatherman bit set to round it out). 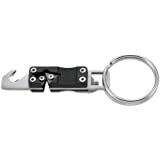 The small crescent wrench may not be extremely practical (it doesn't open very wide) but it's not for car repair - it's just for occasional spur-of-the-moment needs. 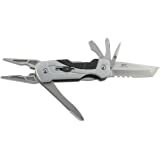 For that use, it's nice to have a tool that is almost impossible to find in other multi-tools. 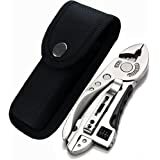 Perhaps my ideal implementation of the Guppie would actually be simply removing the plastic portion and clipping the tool to my Leatherman Wave pouch, which contains the Wave and two sleeves full of bits from the bit kit they sell. 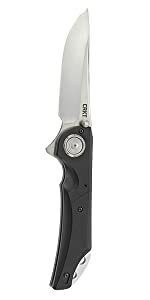 That way, the Guppie provides a new tool, and an easier-to-access knife blade where needed. 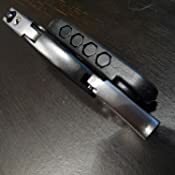 Or, just fiddle with the spotty flashlight performance and possibility of losing the bits, should the magnets fail - still a reasonable bargain for a useful tool. Great concept, unbelievably handy, and fantastic design.... but POORLY made. Mine fell apart in less than a month. My second one did the same. There is no excuse for this, especially from such a reputable company. Oh and good luck keeping the magnetically attached light and bits, yeah right. Lost those on the first week. To be more specific, the area that broke was the adjustable wrench portion. The whole movable head and adjustment knob fell out completely. I have no idea why, either. It isn't like it was being put through any stress, it mostly stayed right on my belt loop or in my pocket. I have had dainty cell phones with glass fronts and no protective case last longer in my pocket than this hunk. Do yourself a favor and look elsewhere for a quality product. it's a gimicky tool. In hindsight, I'd of rather had a Clip with a blade and pocket clip without the hex set and wrench part. I use 3/5 "features" on this tool. 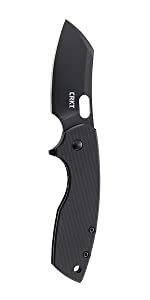 I use the D Ring Clip to hold my work keys, and I use the pocket clip to clip my keys to my pocket (surprising I know) and it's always nice to have an extra knife, Decent blade tho, thin so you can get a razor edge on it but I wouldn't lean on it too much, no locking on the blade either so it's something I'd use like I said if you're last option. 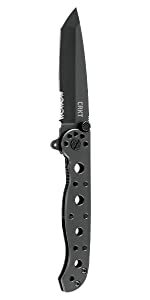 I've got my EDC knife for most already.